Derived form the ancient Greek word ‘sapphirus’, itself derived from similar words in ancient Persian, Hebrew and Sanskrit, sapphire is a gemstone steeped in legend and lore. Once though to preserve the wearer from envy and to attract divine favour, sapphires have also been believed to be able to make peace between foes and act as a symbol of truth and sincerity. The best sapphires are well-cut, clear to the naked eye and most importantly of an intense colour accompanied by a powerful sparkle in their depths. Although most sapphires are blue, they are also found in a rainbow of other colours including spectacular yellows and vivid pinks. The gem gravels of Sri Lanka are famous for their abundance of fancy coloured sapphires including the exquisite orange-pink ‘padparadscha’, named after the Sinhalese lotus flower of a similar colour. Other important producers include Madagascar, Thailand and Burma. 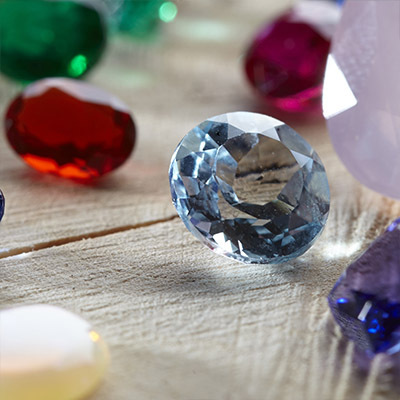 The second hardest mineral after diamond, sapphire belongs to the corundum family. It is hard to believe that sapphires are actually composed mainly of aluminium and oxygen, with the blue colouring provided by the presence of iron and titanium. Sapphire is the choice for a 45th wedding anniversary gift as well as the birthstone for September. Ruby also belongs to the corundum family and is in fact the name for red sapphire, derived from the Latin ‘ruber’. Again composed of aluminium oxide, ruby’s stunning red colour is due to the presence of chromium. Like sapphire the beauty of ruby lies in the richness and intensity of its colour. The ideal colour for a ruby is a fluorescent red like that of a traffic signal, with a lively inner sparkle. The finest rubies display a colour sometimes described as pigeon’s blood. Ruby’s crimson shades have led to associations with passion, blood and fire; the ancient Hindus described the glowing hue of the ruby as an inextinguishable fire that burned within the stone. Another belief was that the lucky owner of a fine ruby was assured of a life lived in peace and prosperity. Rubies are found in marble and in other rocks that were created as a result of prehistoric volcanic eruptions in Africa and southern Asia. The world’s finest rubies are generally thought to be from Burma.Their extreme hardness and durability makes both ruby and sapphire an excellent choice for engagement rings, particularly when used to accent the brilliant clear sparkle of diamond.Ruby is the traditional gemstone for 40th wedding anniversary gifts as well as the birthstone for July. It is thought that in 4000BC emeralds were offered in Babylon, the earliest known gemstone market, and were dedicated by the ancients to the goddess Venus. Throughout history they have been a symbol of immortality and faith; their lush green colour has even led to associations with fertility and life. Derived from the old Greek word ‘smargados’ meaning green stone, the name emerald took on its present form in the sixteenth century, around the time when Colombian emeralds first reached Europe through the explorations of the Spanish conquistadors. Emeralds belongs to the beryl family. Beryl is found in several colours – the pale blue aquamarine is a popular variety but emerald is by far the most valuable. The green colour is due to the presence of chromium in the beryl crystal. Due to their brittle nature emeralds tend to be cut in an octagon shape, which has come to be known as the emerald-cut. Although emeralds lack the fire, high lustre and great hardness of diamond and corundum, the unique velvety green of emeralds places them amongst the most precious of gems. Flawless emeralds are exceedingly rare many emeralds are fractured and almost all contain mineral inclusions. A flawless emerald with a deep rich colour is the most highly prized of all precious gemstones is likely to out-price even a high quality diamond. Emerald is traditionally given as a 55th wedding anniversary gift and is the birthstone for May. Tanzanite is the newest gemstone to be found; deposits were discovered in 1967 near the foot of Mount Kiliminjaro in Tanzania. This remains to date the only place in the world where this rare gemstone can be found. Tanzanite comes from the Zoisite family and has a velvety blue colour with a hint of violet. 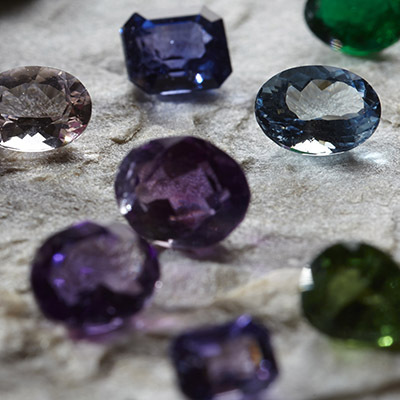 Unlike other gemstones Tanzanite has its own colour grading system, developed and regulated by the Tanzanite Foundation. This gem scores six on Moh’s scale of hardness which means tanzanite jewellery needs to be worn with care. Tanzanite is the first gemstone in almost 100 years to be officially added to the birthstone calendar it has been adopted as an alternative birthstone for December. 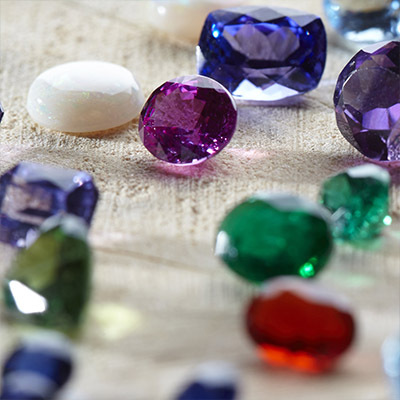 At Pravins we stock jewellery featuring an assortment of coloured gemstones including rhodolite, morganite, aquamarine, amethyst, blue topaz and of course coloured diamonds. In fact we specialise in creating hand-made pieces around individual gemstones. Our staff will be delighted to talk to guide you through the various choices available.